Download NCERT Solutions for CBSE Class 08 Social Science How When and Where How When and Where: (a) Introduce the changing nomenclature of the subcontinent and regions. (b) Delineate major developments within the time frame. (c) Suggest how the sources of study for this period are different to those of earlier periods. Download NCERT Solutions for CBSE Class 08 Social Science From Trade to Territory The Company Establishes Power From Trade to Territory The Company Establishes Power: (a) Unravel the story of a trading company becoming a political power. (b) Show how the consolidation of British power was linked to the formation of colonial armies and administrative structures. Download NCERT Solutions for CBSE Class 08 Social Science Ruling the Countryside Ruling the Countryside: (a) Provide a broad view of changes within rural society through a focus on two contrasting regions. (b) Show the continuities and changes with earlier societies. (c) Discuss how growth of new crops often disrupted the rhythms of peasant life and led to revolts. Download NCERT Solutions for CBSE Class 08 Social Science Tribals Dikus and the Vision of a Golden Age Tribals Dikus and the Vision of a Golden Age: (a) Discuss different forms of tribal societies. (b) Show how government records can be read against the grain to reconstruct histories of tribal revolts. Download NCERT Solutions for CBSE Class 08 Social Science When People Rebel 1857 and After When People Rebel 1857 and After: (a) Discuss how revolts originate and spread. (b) Point to the changes in colonial rule after 1857. (c) Illustrate how vernacular and British accounts can be read to understand the rebellion. Download NCERT Solutions for CBSE Class 08 Social Science Colonialism and the City Colonialism and the City: (a) Outline the nature of urban development in the 19th and 20th centuries. (b) Introduce students to the history of urban spaces through photographs. (c) Show how new forms of towns emerged in the colonial period. Download NCERT Solutions for CBSE Class 08 Social Science Weavers Iron Smelters and Factory Owners Weavers Iron Smelters and Factory Owners: (a) Familiarise students with the processes of de-industrialisation and industrialisation. (b) Give an idea of the technologies of weaving and the lives of weavers. Download NCERT Solutions for CBSE Class 08 Social Science Civilising the Native Educating the Nation Civilising the Native Educating the Nation: (a) Show how the educational system that is seen as universal and normal today has a history. (b) Discuss how the politics of education is linked to questions of power and cultural identity. Download NCERT Solutions for CBSE Class 08 Social Science Women Caste and Reform Women Caste and Reform: (a) Discuss why so many reformers focused on the women’s question, and how they visualised a change in women’s conditions. (b) Outline the history of new laws that affect women’s lives. (c) Illustrate how autobiographies, biographies and other literature can be used to reconstruct the histories of women. Download NCERT Solutions for CBSE Class 08 Social Science The Changing World of Visual Arts The Changing World of Visual Arts: (a) Outline the major development in the sphere of arts. (b) Discuss how these changes are linked to the emergence of a new public culture. (c) Illustrate how paintings and photographs can be used to understand the cultural history of a period. Download NCERT Solutions for CBSE Class 08 Social Science The Making of the National Movement 1870 to 1947 The Making of the National Movement 1870 to 1947: (a) Outline the major developments within the national movement and focuses on a detailed study of one major event. (b) Show how contemporary writings and documents can be used to reconstruct the histories of political movements. 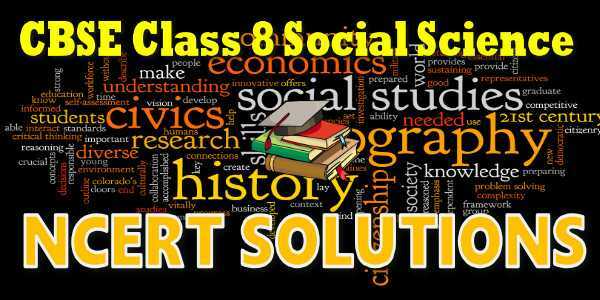 Download NCERT Solutions for CBSE Class 08 Social Science Resources Resources: resources and their types – natural and human. To know the meaning of resources their variety, location and distribution. Download NCERT Solutions for CBSE Class 08 Social Science Mineral and Power Resources Mineral and Power Resources: their distribution, utilisation and conservation, land and soil, water, natural vegetation, wildlife, mineral and power resources (world patterns with special reference to India). Download NCERT Solutions for CBSE Class 08 Social Science Agriculture Agriculture: Types of farming, major crops, food crops, fibres, beverages, agricultural development – two case studies – one from India and the other from a developed country/a farm in the US/ Netherlands/ Australia. Download NCERT Solutions for CBSE Class 08 Social Science Industries Industries: classification of industries based on size, raw material, ownership; major industries and distribution; infrastructure and development. To understand important forms of manufacturing industries. Download NCERT Solutions for CBSE Class 08 Social Science Human Resources Human Resources: composition, population change, distribution and density. To understand the role of human resources in development of nation’s economy. Download NCERT Solutions for CBSE Class 08 Social Science The Indian Constitution The Indian Constitution Vision set forth in the Indian Constitution with a focus on secularism. On how an ideal of the Constitution translates into a law. On how ideals of secularism got translated into fundamental rights. On Fundamental rights as human rights. On Fundamental Duties. Download NCERT Solutions for CBSE Class 08 Social Science Understanding Secularism Understanding Secularism. The term secularism refers to the separation between the power of religion and the power of the State. This is important for a country to function democratically. Download NCERT Solutions for CBSE Class 08 Social Science Judiciary Judiciaryunderstand the main elements of our judicial structure, appreciate the need for the processes followed, understand what an FIR is and how to file one. Download NCERT Solutions for CBSE Class 08 Social Science Understanding Our Criminal Justice system Understanding Our Criminal Justice system. There are four people who play a key role in our criminal justice system. These are: the police, the Public Prosecutor, the defence lawyer and the judge. Download NCERT Solutions for CBSE Class 08 Social Science Understanding Marginalisation Understanding Marginalisation understand what is meant by marginalised, gain a critical understanding of social and economic injustices, develop skills to analyse an argument from the margianlised point of view. Download NCERT Solutions for CBSE Class 08 Social Science Confronting Marginalisation Confronting Marginalisation understand what is meant by marginalised, gain a critical understanding of social and economic injustices, develop skills to analyse an argument from the margianlised point of view. Download NCERT Solutions for CBSE Class 08 Social Science Public Facilities Public Facilities think about the role of government in the economic sphere, see some links between people’s aspirations\ needs and role of government. Download NCERT Solutions for CBSE Class 08 Social Science Law and Social Justice Law and Social Justice think about the role of government in the economic sphere, see some links between people’s aspirations needs and role of government. NCERT 8th class Social Science book solutions are available in PDF format for free download. These ncert book chapter wise questions and answers are very helpful for CBSE board exam. CBSE recommends NCERT books and most of the questions in CBSE exam are asked from NCERT text books. Class 8 Social Science chapter wise NCERT solution for Social Science book for all the chapters can be downloaded from our website and myCBSEguide mobile app for free. In this unit the functioning of parliamentary government and the roles and responsibilities of the various individuals involved in explained in context. In addition the workings of the central government are explained through the steps involved in passing a new law that arose out of people’s struggles. - Translation of felt need into law and the critical features of the legislation. Here is the list of topics covered under each chapter of class 8 Social Science NCERT text book. NCERT Solutions Class 8 Social Science PDF (Download) Free from myCBSEguide app and myCBSEguide website. Ncert solution class 8 Social Science includes text book solutions. NCERT Solutions for CBSE Class 8 Social Science have total 28 chapters. Class 8 Social Science ncert Solutions in pdf for free Download are given in this website. Ncert Social Science class 8 solutions PDF and Social Science ncert class 8 PDF solutions with latest modifications and as per the latest CBSE syllabus are only available in myCBSEguide.